“Some good,” they say. Newfoundlanders and other Atlantic Canadians love the expression and use it often. “Some good” can refer to, for example, a talented singer. “Adele is some good.” It can refer to a movie, as in, “Jurassic World is some good.” It can refer to food. “Leo’s fish and chips is some good.” In fact, the bound words can be used to praise any number of things. Mitton’s cookbook had just arrived. It sat on my desk on a stack of paper. A bright, cheerful image of the author – posed cutting a carrot – taking up most of the book’s cover space. Noticing the latest addition to the organized mess occupying my desk, spouse reached over my shoulder to grab the book. At this point I’d only given Some Good a cursory look and was inclined to think it might be a bit niche, at least that was the impression I got from one of the book’s introductory chapters. It was 14 pages dealing with ailments associated with diet and various food substitutions, subtractions and additions to manage them, called, “Living without Dairy, Gluten, and Refined Sugar.” I panicked slightly when I read the title. “What living?” I wondered. Spouse turned my thinking around. I might have gotten there myself, eventually, but it was obvious that what he was reading was making a positive impression. Mind you, he does have a food allergy; however, I’m certain his enthusiasm for Some Good went beyond vested interest. Although much of the information is standard and preaching to the choir of people with dietary issues, Some Good contains several revelatory tidbits – well, for me at least. For example, in addition to lactose, did you know that some people’s bodies cannot properly break down casein and whey, the proteins in milk? Ingesting them can lead to gut grief and other distressing symptoms. 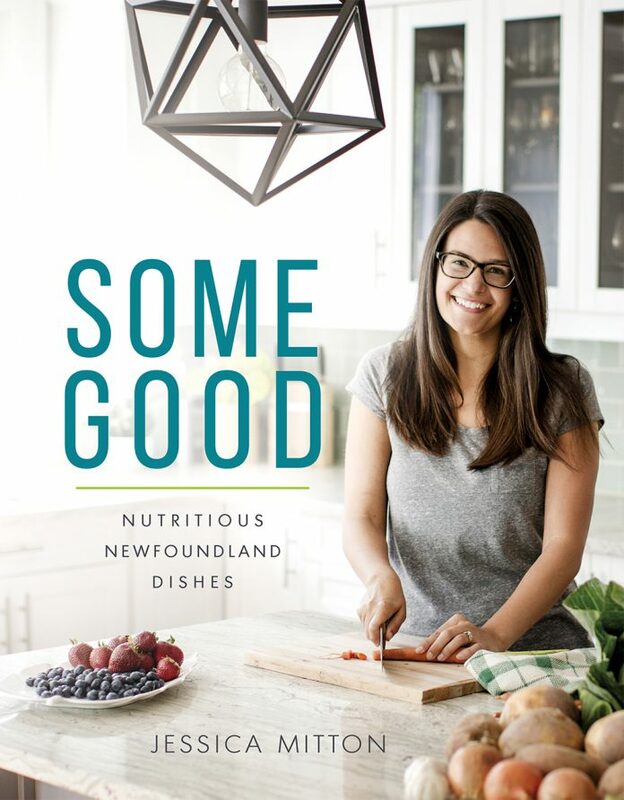 Interesting facts aside, Some Good’s main purpose is to entertain the reader with recipes described as “delicious Newfoundland dishes.” Most cookbooks these days offer between 100 and 150 recipes. Some Good contains 40, a surprisingly low number. More important is how well they work and how they taste. Unlike many Canadian publications, Mitton’s cookbook does not give metric measurements, only imperial measurements. Also, instead of being specific about things like the size of dice or cubes, there is either no advice – just “diced turnip” – or words like “small cubes.” It would be helpful to know if a cube should be one inch or something else. Where guidance wasn’t specific, I went with generous bite size cuts and produced a delicious moose stew from Mitton’s recipe. Finally, a few words about the book’s photographs. Some Good’s photos – by Becki Peckham – apart from the consistently excellent portraits of the author, run the gamut from perfectly fine to passable. I suspect the poorer results were due to inexperience in food photography and not using an experienced food stylist. Photographs of salads, vegetable combinations and breakfast dishes – like poached egg on roasted veg, partridgeberry banana pancakes and blueberry oatmeal bowl – are very good, as well as a very appetizing close-up of roasted chicken. I was bewildered, however, by the decision to include others. The photos of battered cod, baked beans and lobster stuffed mushrooms are unlikely to make anyone’s mouth water. Despite the few uninspiring photos, Some Good, is a cookbook with valuable information and recipes that will yield good tasting results.